VHS Video Tape Mould is a real problem. In fact all tapes including VHS, Beta, Hi-8 and audio cassette tapes can quickly suffer damage from mould growing on the surface and edges of the tapes. If your tapes look chalky it’s time to get a transfer to digital done before it’s too late. VHS tapes can start to deteriorate depending on the climate and the conditions of how the tapes are stored. 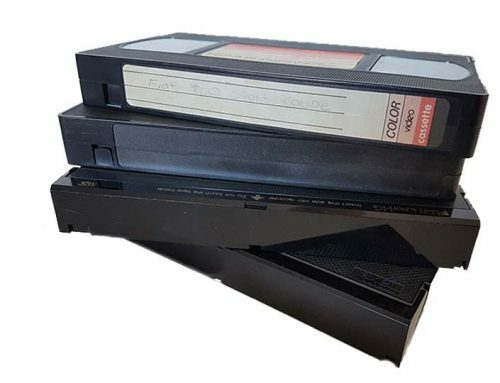 We have seen many tapes in reasonable condition but far too many VHS tapes we see from our clients come into our office with obvious signs of wear and tear and even mold growing on the VHS tapes. The mould looks a little like a white chalky powder and grows over time. The major problem with this is that it starts to dramatically affect the quality of the audio and video signal of the VHS tape and leads to picture dropouts and audio pops and dropouts too, making the video almost unviewable. If VHS tapes or any other tapes for that matter are brought into our studio for transfer to DVD or digital forms, we always check the tapes and we will give you an evaluation of the tapes’ condition before the transfer process begins. Any tapes showing signs of mould are carefully cleaned by hand using a specially formulated isopropanol solution to clean both sides of the tape, hubs and tape mechanisms to ensure the best video and audio quality for your transfer. Your Video Format Options – DVD vs mpeg: Which Format is Right for You? When transferring your treasured analogue video to digital there are many options. In the past years, the DVD format has been a popular format choice to use however with the advent of many pc’s and laptops that don’t have a DVD reader and many TV’s that have a USB port, a USB stick with mpeg4 digital format is becoming more popular. Mpeg4 also referred to as mp4 can also be utilised as a web format that can be uploaded to a website or video portal like YouTube so you can share your videos with family and friends worldwide over the internet. Make sure to tell us about how you plan to play your video and we will suggest the best alternative for you.